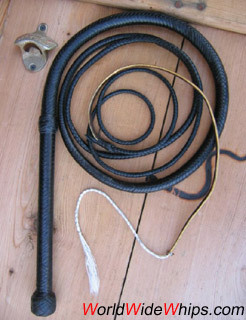 Steve Blanton made this 10ft long, lightweight bullwhip from black kangaroo hide. It measures 10ft and has a 12plt (down to 6plt) thong. I got it from 2nd hand and was able to get further informations from Steve: The whip has a solid leather core, the transition from handle to thong uses a short piece of braided lead core nylon rope to add a little weight to the whip. It has two plaited bellies, probably eight and twelve plait, and it probably has a bolster over the handle and transition section on the first belly only.